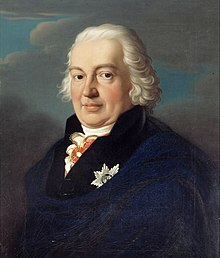 Francis, Duke of Saxe-Coburg-Saalfeld (Coburg, 15 July 1750 – Coburg, 9 December 1806), was one of the ruling Thuringian dukes of the House of Wettin. As progenitor of a line of Coburg princes who, in the 19th and 20th centuries, mounted the thrones of several European realms, he is a patrilineal ancestor of, among others, Queen Elizabeth II of the United Kingdom, King Philippe of Belgium and King Simeon II of Bulgaria. He was the eldest son of Ernest Frederick, Duke of Saxe-Coburg-Saalfeld and Sophia Antonia of Brunswick-Wolfenbüttel. He received a private, careful and comprehensive education and became an art connoisseur. Francis initiated a major collection of books and illustrations for the duchy in 1775, which eventually expanded to a 300,000-picture collection of copperplate engravings currently housed in the Veste Coburg. He was commissioned into the allied army in 1793 when his country was invaded by the Revolutionary armies of France. The allied forces included Hanoverians, Hessians, and the British. He fought in several actions against the French. Francis succeeded his father as reigning Duke of Saxe-Coburg-Saalfeld in 1800. In the discharge of his father's debts the Schloss Rosenau had passed out of the family but in 1805 he bought back the property as a summer residence for the ducal family. Emperor Francis II dissolved the Holy Roman Empire on 6 August 1806, after its defeat by Napoleon at the Battle of Austerlitz. Duke Francis died 9 December 1806. On 15 December 1806, Saxe-Coburg-Saalfeld, along with the other Ernestine duchies, entered the Confederation of the Rhine as the Duke and his ministers planned. In Hildburghausen on 6 March 1776, Francis married Princess Sophie of Saxe-Hildburghausen, a daughter of his Ernestine kinsman, Duke Ernst Friedrich II. She died on 28 October 1776, only seven months after her wedding. There were no children born from this marriage. Sophie Fredericka Caroline Luise 19 August 1778, in Coburg 8 July 1835, in Tušimice, Bohemia 56 years Married on 23 February 1804 to Emmanuel von Mensdorff-Pouilly (later Count von Mensdorff-Pouilly). Antoinette Ernestine Amalie 28 August 1779, in Coburg 14 March 1824, in St. Petersburg 44 years Married on 17 November 1798 to Alexander of Württemberg. Juliane Henriette Ulrike (upon her marriage, she took the name Anna Feodorovna in a Russian Orthodox baptism) 23 September 1781, in Coburg 15 August 1860, in Elfenau, near Berne, Switzerland 78 years Married on 26 February 1796 to Grand Duke Constantine Pavlovich of Russia, the younger brother of Czar Alexander I of Russia (they divorced in 1820). Ernst I Anton Karl Ludwig, Duke of Saxe-Coburg-Gotha 2 January 1784, in Coburg 29 January 1844, in Gotha 60 years Married on 31 July 1817 to Princess Louise of Saxe-Gotha-Altenburg (1800–1831); father of Prince Albert, the husband of Queen Victoria. Ferdinand Georg August 28 March 1785, in Coburg 27 August 1851, in Vienna 66 years Married on 30 November 1815 to Maria Antonia Koháry de Csábrág; father of Ferdinand II of Portugal and Victoria, Duchess of Nemours, and the grandfather of Ferdinand I of Bulgaria. By his marriage he became the founder of the Koháry branch of the Saxe-Coburg and Gotha line. Marie Luise Victoria 17 August 1786, in Coburg 16 March 1861, in Frogmore House 74 years Married on 21 December 1803 Carl Friedrich Wilhelm Emich, Prince of Leiningen, had issue. After his death, she married on 11 July 1818 Prince Edward Augustus, Duke of Kent and Strathearn, the fourth son of King George III of Great Britain, the mother of Queen Victoria. Leopold Georg Christian Frederick 16 December 1790, in Coburg 10 December 1865, in Laeken 75 years Married, firstly, on 2 May 1816 Charlotte of Wales, daughter of George IV of the United Kingdom,who died from complications of childbirth on 6 November 1817. Married, secondly, on 9 August 1830 to Louise of Orléans and his children included Leopold II of Belgium and Empress Carlota of Mexico. First king of the Belgians under the name of Leopold I. His male-line descendants established ruling houses in Belgium, United Kingdom, Portugal and Bulgaria, while retaining the duchy of Saxe-Coburg and Gotha until 1918. His son Leopold ruled as Leopold I of the Belgians. A grandson reigned jure uxoris as King Ferdinand II of Portugal while a great-grandson named Ferdinand became the first modern king of Bulgaria. One of his granddaughters was Empress Carlota of Mexico, while another was Queen Victoria of the United Kingdom. The latter's son, Edward VII, a patrilineal as well as matrilineal great-grandson of Francis, inaugurated the male line which wore the British crown until the accession of Queen Elizabeth II in 1952. ^ Genealogie ascendante jusqu'au quatrieme degre inclusivement de tous les Rois et Princes de maisons souveraines de l'Europe actuellement vivans [Genealogy up to the fourth degree inclusive of all the Kings and Princes of sovereign houses of Europe currently living] (in French). Bourdeaux: Frederic Guillaume Birnstiel. 1768. p. 108. August Beck: Franz Friedrich Anton, Herzog von Sachsen-Koburg-Saalfeld. In: Allgemeine Deutsche Biographie (ADB) vol. VII, Duncker & Humblot, Leipzig 1877, p. 296.